Backed by a powerful engine, computer-assisted coding provides a comprehensive solution capable of reading and interpreting reports. With HIT system acquisition and implementation and the training required to meet a growing number of mandates, it is difficult to envision any hospital shifting painfully limited financial and IT resources to the deployment of software that does not directly impact compliance. But when it comes to computer-assisted coding (CAC), many are doing exactly that. The justification for doing so is simple: There are few downsides to CAC, and those that do exist are overshadowed by the upsides. In a nutshell, with CAC, electronically produced clinical reports are read by a natural language processing (NLP) engine, which interprets the reports and suggests codes. “Instead of coders using ‘brainware’ to read and interpret reports, with computer-assisted coding they edit and validate the ICD-9 and/or ICD-10 codes suggested by the NLP engine, thus saving time and costs throughout the entire process,” says Joanne K. Murphy, RHIA, HIM solutions product manager for QuadraMed Corp, a healthcare technology and services provider whose product line includes inpatient and outpatient CAC solutions. Many facilities are turning to CAC to combat the continued shortage of professional coders and increase coding productivity and accuracy, with many quickly discovering additional benefits that go beyond the coding process. Hilerio notes that RWJUH utilizes CAC for coder education and “homegrown” coder training, which has helped it maintain appropriate staffing levels despite the shortage. The technology is also beneficial when coding cases with lengthy admissions, as the system highlights every code that a coder could potentially forget to read and pick up for final coding, which could impact the correct diagnosis-related group (DRG) assignment. “The solution can just read the electronic text and [assign] codes, so it’s very beneficial,” Hilerio says, adding that greater benefits are realized by those departments that are already fully electronic. Eminger goes a step further, differentiating between those systems that are a hybrid of electronically input data and handwritten, scanned information and those that are fully electronic. The latter, she says, will realize greater benefits from CAC, although even hybrid system users will see results. Adventist Health System, a not-for-profit healthcare organization based in Winter Park, Fla., whose flagship facility is Florida Hospital, utilizes Dolbey’s Fusion CAC powered by EMscribe. CAC has minimized the need for coders to continually navigate through complex encoder prompts and pathways before they can post commonly selected codes. It has also reduced the number of edits and errors on claims scrubber reports. Further, because the coder now addresses all edits at the time of coding, turnaround times are faster. In fact, Migdalia Seda-Hernandez, RHIT, Adventist’s director of corporate HIM management services, notes that the hospital system has realized so many benefits, it is currently looking into leveraging CAC to implement an automated coding workflow on certain accounts. This implementation is expected to further accelerate turnaround times and improve documentation. Providing coders with ample time and support to make the transition from coding to editing is critical to successful CAC implementation. Because the shift from coding to editing made possible by CAC increases productivity, proponents say it is well worth the effort. “CAC has the ability to transition today’s coders to become editors and code validators, enabling them to more accurately process more records per hour than was possible previously,” says Gina Sanvik, RHIA, HIM solutions product manager for QuadraMed. She notes that CAC can increase coder productivity by as much as 20%. This, in turn, accelerates the billing process and reduces days in accounts receivable, increasing cash flow and speeding the overall revenue cycle. What’s more, the benefits of CAC can be felt beyond the boundaries of the HIM department. 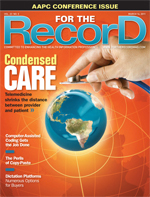 “It can assist facilities in better understanding their patient outcomes by unlocking the knowledge behind data contained within the EHR,” Sanvik says. While most agree that the benefits of CAC outweigh its drawbacks, this does not mean there are no barriers to clear in order to reap a meaningful return on investment (ROI). Perhaps the steepest is the technology itself. As noted previously, the greatest benefits are gained by facilities that have already transitioned to a primarily electronic environment. “CAC really requires implementation of EMRs in order to capture the clinical information. In addition, terminology standards such as SNOMED CT can help to capture that clinical information in a codified manner, facilitating conversion to administrative codes such as ICD-10,” says Brian Levy, MD, senior vice president and chief medical officer of Health Language, which provides software for managing and updating standard and localized medical terminology. Another significant hurdle for many facilities is securing the IT resources necessary to implement the system. This is particularly true today when there are many competing priorities and few resources. In fact, the need to get on IT’s radar was the only real drawback identified by Hilerio, who notes that RWJUH implemented its CAC in phases. Eminger points to the need to interface with multiple systems as a major hurdle as well as the need to capture and read information from the complete patient record. Unlike interfaces designed to collect information for transcription, billing, and even radiology, CAC requires the ability to grab and read images and content in a completely different way. There’s also the matter of customization. “The other struggles with CAC is customizing the engine to fit the customers’ needs for coding and flow of work because every hospital does coding slightly differently,” Eminger notes. Prior to deploying its CAC system, Adventist Health’s HIM team first spent time evaluating and planning for all phases of development and implementation. This included identifying necessary interfaces of all transcribed documentation as well as any structured data contained within the EMR. Future state process maps were drafted and end user and management approval secured to eliminate the need to redesign interfaces during the implementation phase. Because part of Adventist’s goal with CAC deployment was to integrate review of account charge detail for CPT validation and modifier additions during the coding process, it also wanted the solution to present coders with National Correct Coding Initiative and medical necessity edits. This required extensive reviews of the current chargemaster, which helped determine which ranges or revenue codes needed to be included. Chargemaster codes and ranges of charges that were automatically posted by the charge description master were evaluated, and the NLP was programmed to ignore certain textual phrases that could result in code duplication. Following go-live, Adventist continues monitoring and refining its CAC system to meet changing needs. “Our hope is that additional time and resources invested in an ongoing review of the workflow in response to coder feedback will expedite the adoption process,” says Seda-Hernandez. For those hospitals considering a transition to CAC, maximum value will be derived from conducting a careful predeployment analysis to identify issues and working with a vendor to refine and customize functionality. It’s also important to build in sufficient time for coders to adjust to their new role as editors and to secure IT buy-in from the outset. Most that have made the leap agree that, when done properly, CAC deployment is a wise investment. As the deadline to complete the transition to ICD-10 nears, the organizations that have implemented computer-assisted coding (CAC) systems are likely to find the process less disruptive and costly than those that have not. HIM industry analysts predict that coder productivity losses during the transition will range anywhere from 10% to 50%, notes Joanna K. Murphy, HIM solutions product manager for QuadraMed. CAC “is a powerful tool that can accelerate coding processes and help mitigate productivity losses due to the transition to ICD-10,” she says. New Jersey’s Robert Wood Johnson University Hospital is deep into its ICD-10 transition planning, and its five-year-old CAC solution is playing a central role in the process. HIM Director Cecilia G. Hilerio, RHIT, says CAC’s comprehensive coding capabilities offer an advantage and once it is programmed with the proper terminology, it will be an invaluable tool for coders. When it comes to inpatient vs. outpatient, most agree there is little difference in terms of how computer-assisted coding (CAC) impacts the workflow of coders in each setting. What is different is how the natural language engine reviews the record. In particular, there are different coding rules between the two settings. For example, “possible” and “probable” can be coded in an inpatient chart but not in an outpatient one, says Heather Eminger, CAC product manager for Dolbey. These differences make it more difficult to implement CAC in the inpatient setting. Hospital coding is far more complex and requires far more predeployment analysis, according to Migdalia Seda-Hernandez, RHIT, director of corporate HIM services for Adventist Health System, which implemented outpatient CAC first. “Implementing CAC in hospitals was more difficult as it required extensive analysis, investigation, and design of multiple coding workflows,” she notes. For example, implementation in the hospital setting required integration of computerized coding icons within the electronic coding application that displays account charges. Encoder interfaces for multiple patient types were also required. While the inpatient workflow was simpler in the hospital, coding inpatient accounts also required coders to edit a larger number of codes due to the number of symptom codes suggested by the system.